I’ve been slow to warm to Wes Anderson. I like his quirky style, but not always 100 minutes’ worth; it often feels forced and gratuitous. With Moonrise Kingdom, either Anderson has tweaked the formula, or I have developed a taste for it. The movie opens with many introductions. First we meet the Bishop family through a perpendicular tracking shot: a roomful of children listen to a record that introduces all the instruments of the orchestra, a la Peter and the Wolf. Above them sits big sister Suzy (Kara Hayward) looking out of every window with her binoculars. Downstairs are mom and dad (Frances McDormand and Bill Murray), both lawyers. We are on the East-coast island of New Penzance and in the year 1965. Elsewhere on the island, a troop of Khaki Scouts are setting up for the Hullabaloo. Scout Master Ward (Edward Norton) merits another perpendicular tracking shot as he carefully inspects his boys for tucked shirts, safety procedures, and meritorious behavior. Inspection reveals one scout is missing. Sam (Jared Gillman) has perfectly arranged his tent and carefully left his resignation taped to the canvas. He has arranged to run away with the girl he met last summer at the Noah’s Flood play: Suzy Bishop. When the children are discovered missing, the adults mobilize behind Captain Sharp (Bruce Willis), the island’s one officer of the law. As for Sam and Suzy, by the time the film is half over, Sam has built them a perfect camp site which they’ve named Moonrise Kingdom. The young lead actors are unpolished, which I am sure is exactly what Anderson was going for. Anderson tries some new digital special effects, and they are not entirely seamless. Night scenes in a storm are noticeably digitized, and Edward Norton’s leap over a mighty river looks like it was done on iMovie. These visuals feel a little out of place in Anderson’s organic style, where sets, props and costumes anchor the quirkiness in reality. Anderson’s style is present but it doesn’t overpower the characters and story. There are stagey scenes and implausible supporting players — a late-introduced Harvey Keitel dominates Edward Norton as though the Khaki Scouts were a military organization. But these fit the light comic tone without feeling imposed from above. 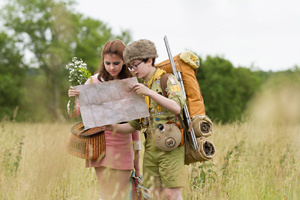 Moonrise Kingdom is sweet, not saccharine. With Moonrise Kingdom, I think I’m warming to Wes Anderson’s style. Someday when he’s closer to retirement I’d like to watch his films in sequence as a retrospective. I may not have appreciated until now what a body of work he’s been assembling.